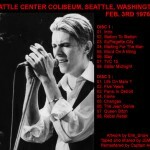 David Bowie 1978-12-12 Tokyo ,Nihon Budokan Hall – Merry Xmas Mr Bowie – ( Vinyl rip ). 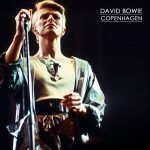 This concert – the very last of the ’78 tour – was filmed com­pletely,but only half of it was broadcast on Japanese TV,in the programme ‘The Young Music Show’. 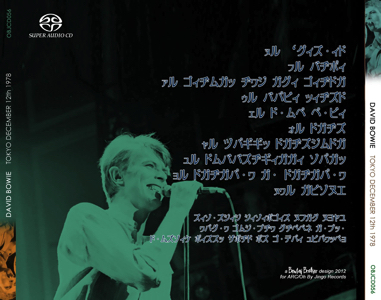 Most of the numbers are accompanied by simultaneous translations into Japanese of the words he is singing. Five Years is one of them – then Dennis Davis suddenly appears wearing some sort of gorilla mask,but after a couple of songs he takes it off again. The audience is barely heard or seen until after the speeding up in Station to Station. After Station to Station one can seen the audience shouting for an extra until Bowie comes back to release a cheerful version of TVC I5.